Peter Horne is a young Glasgow Warriors back who was called up to the senior Scotland squad in October 2012. 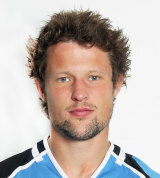 Horne, who represented Scotland at under-18, 19 and 20 levels, joined Glasgow Warriors in 2009 and spent the 2011/12 season with the Scotland sevens squad. In 2012 he signed a new contract with the club taking him through to 2015.